With the first day of summer just around the corner, we are preparing for National Aboriginal Day on June 21, and Canada 150 celebrations on July 1. As part of our committment to truth and reconciliation at Mount Pleasant Neighbourhood House, a group of 50 people composed of staff and board members participated in a daylong interactive workshop on June 9. 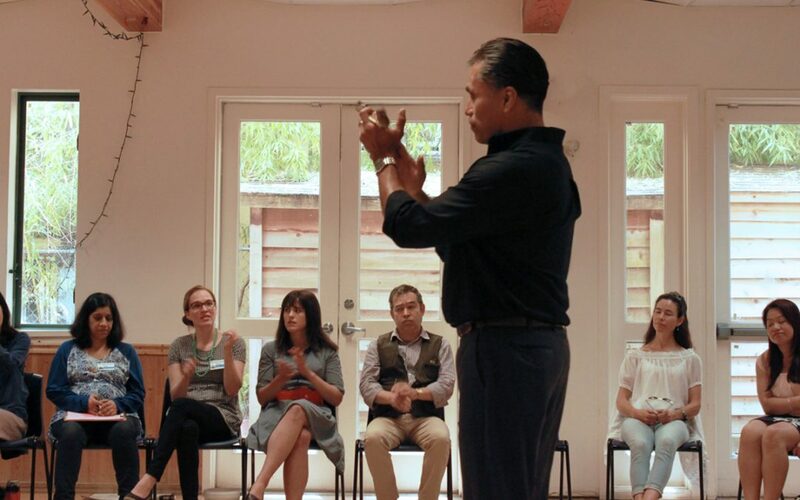 In the morning, Brad Marsden (Gitskan Nation) led us through a powerful experiential workshop to help educate service providers of the collective trauma that has impacted Native people throughout Canada’s history. As a Residential School Counsellor and Facilitator with training in SafeTalk and Suicide Intervention, Brad invited us into a better and more accurate understanding of Gitskan culture—from before colonization, during the time of residential schools, and in the present. After a moving experience in the morning, we shared a lunchtime meal of traditional foods like wild salmon from Skipper Otto, herring eggs, and Three Sisters soup made from squash, corn, beans. Our chef Andrew Hunter (Anishinaabe Nation) added some manoomin (wild rice) to make sure we had a taste of his culture too. At Brad’s suggestion, the youngest members of our group served food to the eldest, following the tradition of the Gitskan people. Enjoying food and togetherness helped revitalize our spirits for the work ahead. Jolene Andrew (Wet’suwet’en & Gitxsan Nations) led us in dance, reminding us of the importance of play in our lives as service providers. In groups of twelve, we worked together to understand the different ways we think of concepts from resistance to rediscovery. Inspired by Jolene’s leadership, we sat down to answer questions about the work we do, and what actions we can take together to support the promises of truth and reconciliation in the Mount Pleasant Community. In the coming weeks, we look forward to sharing our learning through Aboriginal and multicultural programs at Mount Pleasant Neighbourhood House, and we invite you to join us on our journey.